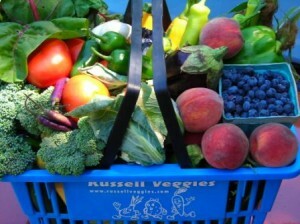 A family farm for more than 50 years, Russell’s started as a traditional farm located in Floyd County, Indiana growing vegetables primarily for personal consumption by the family. They then began growing pickles for the Paramount Pickle plant in Louisville, Kentucky as well as strawberries for the berry association in Floyds Knobs. Later they raised a variety of produce that were taken by truck to various markets in Louisville. Over time, the family farm slowly dwindled back to its origin, farming for personal consumption. My husband, Kenny, is the last Russell to farm this land here in Southern Indiana. We still retain our traditional farming roots by growing many varieties of fruits and vegetables. Our primary outlet is the New Albany Farmer’s Market; we carry local produce including tomatoes, heirloom tomatoes, yellow squash, zucchini, berries, potatoes, onions, garlic, kale, apples, beans, cucumbers, pickles, several types of pepper (from the mildest to the hottest), and much more. We grow our own produce or purchase it directly from local farmers to ensure the freshest and highest quality product. Our veggies are as naturally grown as possible, 0n our veggies like broccoli, cabbage and cauliflower we use Diatomaceous Earth (DE), which is 100% organic. We found that this worked fantastic this year and will use as needed on our other veggies. Our fruit is never sprayed after the bloom sets, and no chemical process is used as a preservative. That’s why the shelf life is not that of the grocery stores. We do wash our veggies before we sell them. No pesticides or fertilizer is used on our lettuces, greens or herbs, we fertilize with rabbit and chicken poo. Safe Solutions’ Food-grade quality Diatomaceous Earth is sold as a dietary supplement. The following statements regarding its use as a nontoxic pest control device are the opinions of IPM expert Stephen Tvedten and do not represent the instructions given by Safe Solutions. DE must be used with discretion when applying. For example, when DE is used for organic gardening, care should be taken to not apply DE to the flowers of the plant in order to protect the bees that will land there for pollination to occur. Remember, all insects serve a purpose in nature, even those considered pests, and eliminating them causes change. DE has long been implemented by farmers to protect their harvest and livestock from attack by insects. DE is added to grain storage bins to stop invading pests and also to livestock feed to eliminate internal parasites and other animal ailments. DE is added to baking flours as an anti-caking agent – you have likely eaten bread that was made from flour containing DE. Eating DE can have many health benefits for animals and humans alike, but it is imperative to only consume DE that is from food-grade quality sources. Some forms of DE can be toxic. It is important to recognize that not all forms of diatomaceous earth are non-toxic and safe to use for organic gardening and agriculture. DE that is used for swimming pool filters is toxic to humans and will not control insects. Other brands of DE advertised as “insecticidal” often have additives of chemicals such as pyrethrum and piperonyl butoxide – these products are not safe to eat and should not be administered to animals or humans. Safe Solutions DE is 100% non-toxic, food-grade quality mined from uncontaminated fresh-water deposits. DE, or Fossil Shell Flour, is composed of ground diatoms, microscopic fossils which are mined from deposits of water. Diatoms are the tiny single-celled plants and plankton that live in the sea by the billions, and provide the foundation of the food-chain for all marine life. Even the great whales could not survive without the diatoms. As diatoms die, their exoskeletons drift to the bottom, building up large deposits of diatomaceous earth over time. Geologic changes gradually shift these sea deposits to dry land, making them available for mining. Because of water currents, many deposits become impure, some even containing arsenic, and can be dangerous. Safe Solutions DE comes from a pure fresh-water deposit that is guaranteed as “Food Grade” quality and is 100% non-toxic – no chemical additives.